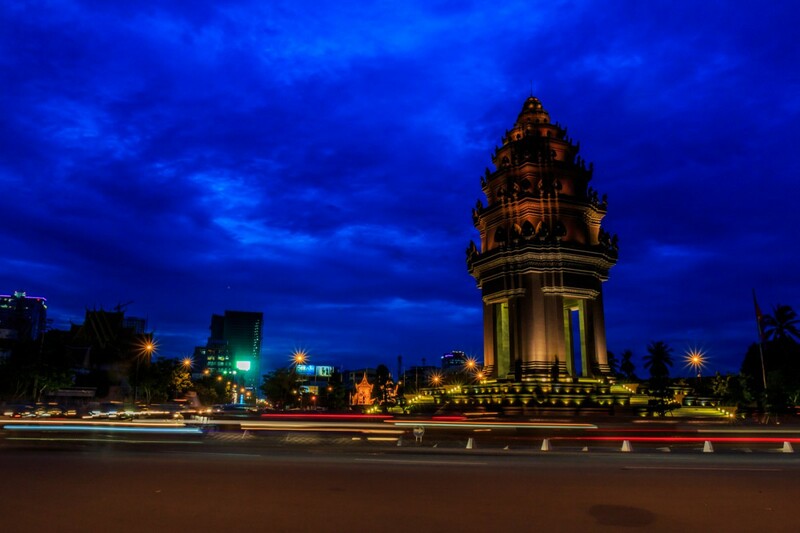 I always liked Cambodia’s capital, Phnom Penh. It’s set on the Mekong River, and has several scenic temples. The city is spread out, but doesn’t feel like a big city because there aren’t many skyscrapers. There are lots of interesting street markets. Traffic isn’t too crazy. There aren’t that many shopping malls or western fast food chains. 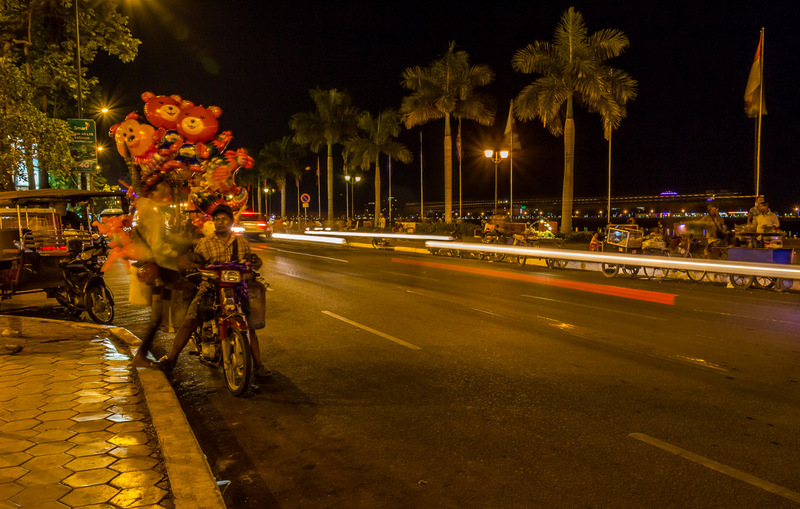 I wanted to stop somewhere for a month to work, and Phnom Penh was the perfect place. But it’s changing. Skyscrapers are under construction. This is my third visit, and every time I come back there’s more traffic. There are more fast food restaurants and malls. So I want to experience it before it gentrifies. After five months staying in guesthouses, I really wanted an apartment with a kitchen. Cheap apartments are easy to find in Phnom Penh; just ask on of the ubiquitous moto drivers to take you around. But you have to sign a three month lease, which I wasn’t ready to commit to. My budget is $400 or less for a month. I checked Airbnb, but they are overpriced. You are paying a premium for the convenience of being able to book online from your home country. 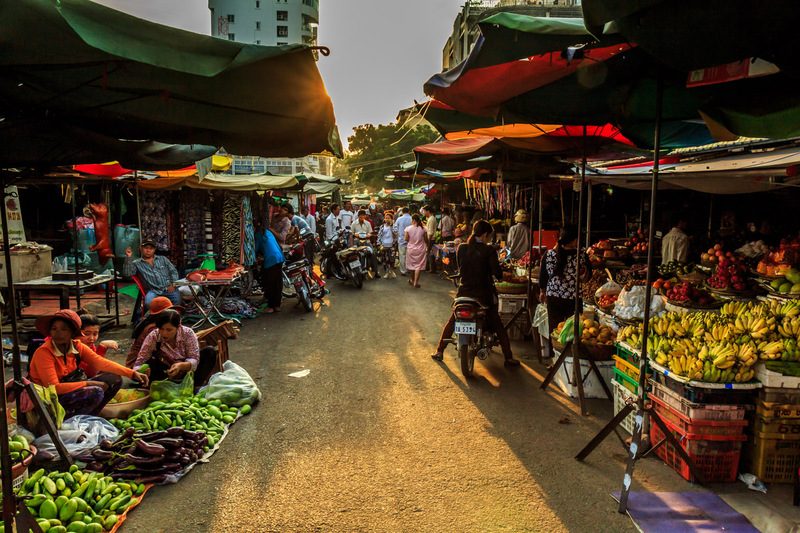 The best way to find a place in Phnom Penh is to pound the pavement. And pound it I did. There is a place that rents for $200 a month, Murray’s Place, but it’s far from the riverside area I’m staying in. I walked all the way there in the blazing heat, and it took me an hour. A tuk tuk back cost $4. Not only is it far from the center, it’s a bit of a dump. Next I called Art the Homefinder, a local guy who makes a living showing people apartments. But he couldn’t help me for a one month stay. I was on my own. Vtrust Serviced Apartments rents a room for $300. I hopped on a moto to check it out. It was decent, but no kitchen, and far from Riverside. I’ll probably be going to Riverside every day to work, because that’s where all the cafes with wifi are. The low price would get eaten up by moto taxis, or a rented motorbike. 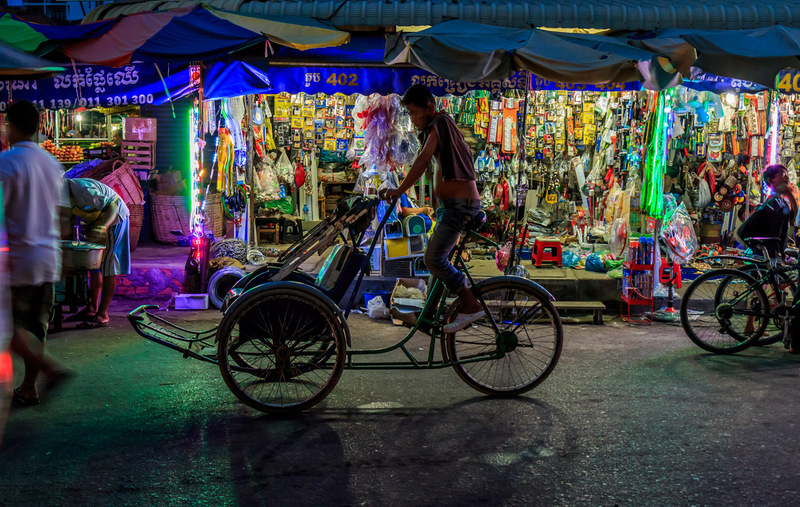 A cyclo at the market. So I ended up walking around the Riverside area, on streets back from the river. I rather like the neighborhood. It’s lively and has lots of markets. I found two places in my budget that were ok. Phnom Penh Guesthouse had a nice balcony overlooking the street. But I liked the room on the sixth floor of the Blue Kiwi Guesthouse. After spending a lot of time in tiny rooms with no windows, I loved the two windows overlooking the city. I won’t mind spending time there working! I’m publishing the article as I originally wrote it after just a couple days in Phnom Penh. In retrospect, the Blue Kiwi was terrible. It’s only a good choice for tattooed weirdos who’s every other word is the f-word. It’s not a family friendly place. The touristy Riverside area got old quickly. There are many cafes in the BKK1 neighborhood, which Vtrust apartments is in. That would probably be a better choice for staying a month. The market in the evening. So where did you end up staying there? I stayed at the Blue Kiwi for a month, and regretted it almost immediately paying. The V Trust serviced apartments are a decent place to stay for a month.